About two weeks ago Red Duck's Ra #2 left quite an impression on me. The natural progression from that beer was forward a few thousand years to the 15th Century and Red Duck's Gruiter. Hopefully this historical beer will be as interesting as the Ra #2. The Gruiter is a dark sour ale more commonly known as a Scottish Gruit, a beer flavoured and predominately bittered by a combination of herbs instead of hops. The style has almost been eradicated by the popularization of the use of hops in beer. I can't wait to see what Red Duck will produce for this style. When poured Gruiter seems to have slightly more combination than the Ra #2 but that is where the similarities end. It's a very dark beer with only a tiny layer of brown bubbles forming a "head". At first the beer is a relatively clear dark brown colour but as it warms it seems to cloud over a bit and by the end it looks simply like liquid vegemite. Odd indeed! The nose is actually very nice, there is plenty of a grape like aroma. This is accompanied by the aromas of lots of spices, ginger and pepper seem the most prominent to me but my track record with distinguishing spices is pretty average. As the beer warms more dark fruit aromas emerge as does an oddly yeasty smelling malt. All of these aromas combine to produce quite an impressive combination. 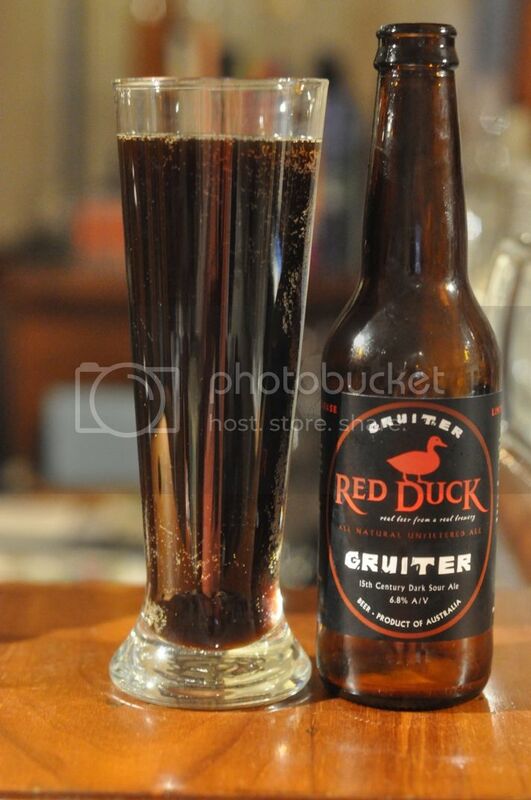 Red Duck really try and push boundaries and with the Gruiter they certainly have. I'm torn between my love of sour things (which this certainly is!) and wanting it to taste a little bit more like a beer. As for what it tastes like, it's mostly very acidic (or salty I'm undecided...) grapes and this pretty much swamps everything else. However there is a little bit of smokiness towards the backend. The beer is also completely flat, which makes the mouthfeel unusual to say the least. After tasting Red Duck's Gruiter I know the answers to a few questions which I never would have thought I would need answers to. 1. Would I have liked to be a beer drinker in the 15th Century? No. 2. How would you describe a Scottish Gruit in one word? Odd. and 3. Are historic brewing styles a good thing to brew? Absolutley. I didn't particularly like the taste of the Gruiter but I didn't hate it either. Red Duck are doing a very brave thing with these historic styles of beer and I think it's something that should be promoted and supported more. Well done guys!